Trigon General Contractors and Construction Managers, Inc.
Trigon has had the privilege of working on several projects of historical significance including Boston Avenue United Methodist Church, Philbrook Museum of Art, St. Joseph Monastery (1929) and the Harwelden Mansion, all on the National Register of Historical Places. We recently completed a 438 window restoration of Will Rogers High School in Tulsa, Oklahoma. At Philbrook Museum of Art, we restored 23 acres of historical gardens, constructed the new South Allee Garden and restored the exterior of the original Villa, completed in 1923. Our work at Philbrook was recognized both locally and nationally with "Excellence in Construction" Awards from the Associated Builders and Contractors of America. 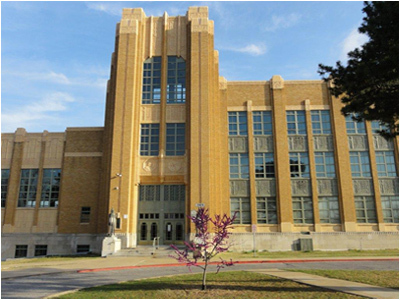 Will Rogers High School, located in Tulsa, Oklahoma is listed on the National Register of Historic Places. The existing rolled steel windows and steel doors were considered significant features of this historic building. 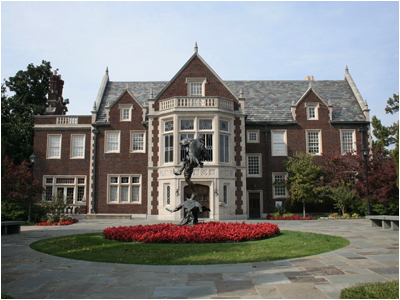 Trigon had the privilege of replacing all of the 438 windows and several doors with materials maintaining the visual characteristics of the originals. Restoration and repairs were also made to the terra cotta of the towers on this historic building. The Cornerstone Project consisted of an Interior Renovation, an Exterior Restoration, a new Parking Structure, a new Bell Tower, and site improvements including parking, paving, exterior lighting, irrigation and landscaping. The construction was coordinated with Monte Cassino School. The work was coordinated to minimize conflicts to insure the safety of the residents and visitors. 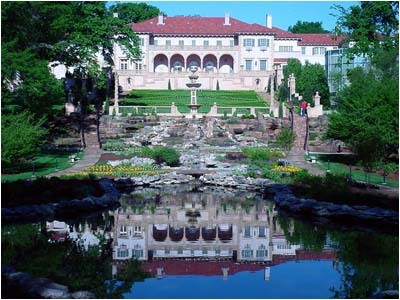 Trigon was selected as Construction Manager for the Gardens and Grounds Renovation at the Philbrook Museum of Art in Tulsa, Oklahoma. The project site consists of 23 acres of gardens. The construction was completed in 22 months at a cost of $7,000,000. The project was completed on schedule and $103,000 under budget. The Villa restoration consisted of cleaning and restoration of stucco, restoration of cornice, painting and addition of new handicapped entry from the interior to the gardens. All of the walkways were removed. The stones were cataloged and re-laid in the original configuration after new footings and drainage system was installed. The two fountains were restored with new mechanical and filtering systems. New lighting was installed. A new irrigation system was installed in the garden and all of the plant materials were replaced. The existing waterfalls were removed to the ground and rebuilt per the original plans from 1926. The original boulders were cataloged and replaced in the same location. The stone stairs were also replaced and new iron handrails were added. A new circulation and filtering system was added with the mechanical components located in a nearby cellar. A new irrigation system was installed and new plantings were added. The existing pond gardens were renovated with new skimmers, circulation and filtering system that is shared with the waterfall garden. A new reinforced concrete and plaster shell was installed inside the existing pool. New underwater planters were constructed. The walkway around the ponds was rebuilt with stone salvaged from the same area. New lighting was added at the walkways as well as in the surrounding trees. New site furnishings, irrigation and planting were installed. The concept for the South Allée Garden was one from 1926 that was never constructed. Howell & Vancuren Landscape Architects prepared new plans based on the original concept. The South Allée consisted of 4 new terraces with Kasota Stone walls, flagstone walks, 6 new ornamental iron niches, lighting, new iron handrails, fountain reconstruction, new irrigation and extensive landscaping. The Kasota Stone was from the original quarry that furnished the stone for the Philbrook Villa in 1926. To duplicate the cast iron details at the railings, molds were made from the original components at the Villa. The 23 acres of gardens were connected with new colored concrete walkways. There was a new ramp from the Formal Garden to the lower lawn area to allow the entire site to be ADA compliant. There was a new pedestrian bridge installed to span Crow Creek and allow access to the east portion on the south end of the creek. There were new ADA restrooms constructed. One was at the North end of the site and was an addition to the existing maintenance building. The other was at the South end of the site and was an addition behind the existing Summer House. This PFPI (Privately Funded Public Improvement) required the removal of the existing debris, silt, trees and failed walls along 1600 lineal feet of Crow Creek as it flows through the property. Trigon was the Construction Manager for this work and the W. N. Couch Company was the PFPI Contractor. The restoration consisted of new stone walls, a new low water crossing and 2 low water dam structures. All of the work was performed while maintaining the continuous flow of Crow Creek and included several flooding events during construction. The maintenance area parking lot was removed and replaced with a larger parking lot with lighting. The front circle drive was removed and replaced with new curb and gutter and asphalt paving. The electrical work consisted of a new service, site lighting, parking lot lighting, tree lighting, landscape lighting and a centralized control system allowing Philbrook to control the lighting from the security office as well as to create different “scenes” that can be preset for effects in the various gardens. In addition to the individual gardens a new irrigation system was installed throughout the site. The irrigation system consisted of 5 automatic controllers connected to a centralized computer system. In addition to the various gardens, there were numerous trees and shrubs installed throughout the site. Trigon was Construction Manager for the renovation of the exterior site improvements at the historic Harwelden Mansion in Tulsa. The renovation included 2 new parking areas, a bluestone plaza featuring a new bronze sculpture, new lighting, signage, irrigation and extensive landscaping. 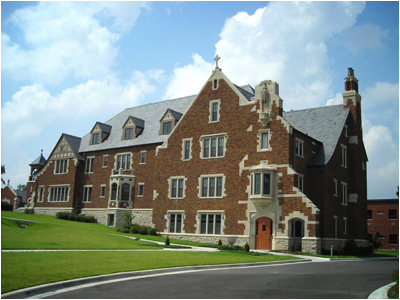 We could not be more pleased with the end result of the monastery renovation. The remodeling of the first two floors and the addition of our parking pavilion and bell tower are truly masterpieces of fine craftsmanship. Philbrook has been through several major construction projects in the past. This is not only the first project to be completed on time, but also significantly under budget. We are so thankful that we chose Trigon and look forward to future projects with your fine company. The community is so pleased with our results at the historic Harwelden Mansion. The management of our budget and timetable were exemplary and I was so pleased when the project was finished on time. In large measure thanks to your efforts, the public entrance to this important public building now has a presence that befits its wonderful history and work.